* fixed a bug that wave images were not created properly. * fixed some minor bugs to improve stability. 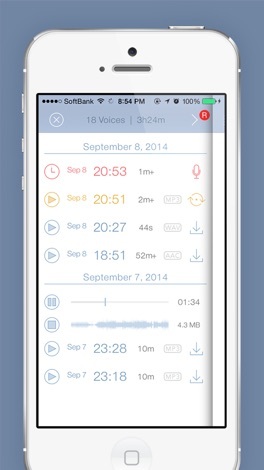 Voice Droplet is a simple and practical voice recorder with auto-upload feature to Dropbox. MP3 (.mp3) and AAC (.m4a) encoding formats are also supported as In-App purchase option. 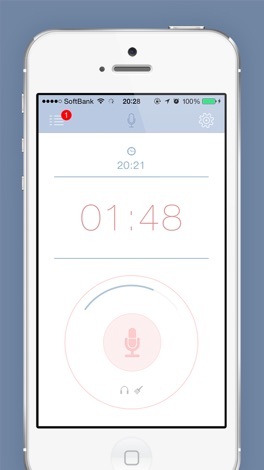 All you need is just to tap start/stop button (or shake) for recording. Saved audio sources will be processed and uploaded to Dropbox with completely automatic. Whole recoding task will be split into every 10 min (default) to keep integrity as far as possible. This means you can minimize the probability to lose your audio data when app/device crashes. for better listenability, tuned for human voice tone. You can also omit silent regions automatically. You can get high quality MP3/AAC encoding audio instead of default WAV format (In-App purchase option). Basic metadata is also embedded properly for better organization. Audio file encryption feature (AES256 format) is also supported (In-App purchase option).